A sketchy order assembly sheet leaked out by Twitter account @The_Malignant reaffirms many of the previously talked-about features that should come to the iPhone 7 and iPhone 7 Plus come this fall, including a 256-gigabyte capacity model and the lack of the widely criticized 16-gigabyte tier. First spotted by AppleInsider, note that the sheet doesn’t bear any clear designation identifying Apple as the client. 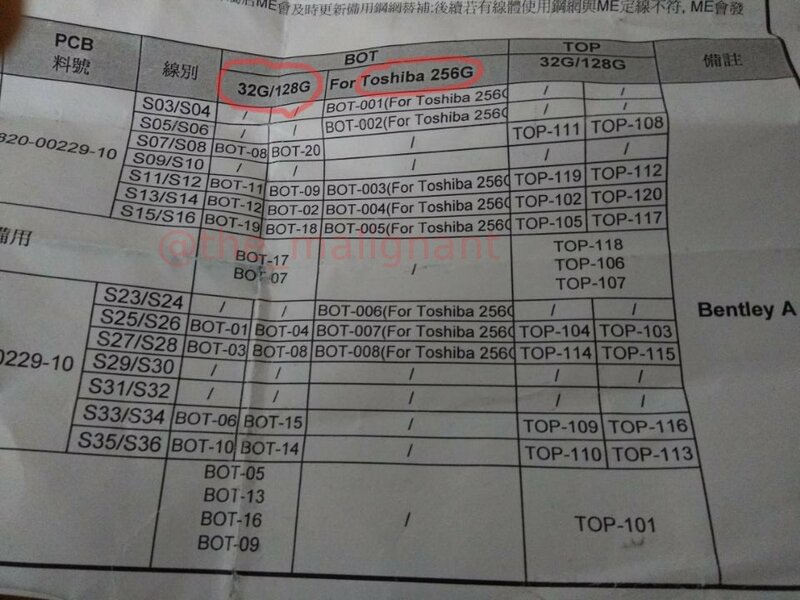 According to the sheet, Toshiba will supply NAND flash chips for some 256GB iPhone 7 units, with an unknown manufacturer providing memory chips for other storage tiers. It’s unclear if the rumored 256GB tier will be offered across the entire lineup or be exclusive to the 5.5-inch iPhone 7 Plus model, which should also have 3GB of RAM due to the dual-lens camera’s increased compute requirements. The same Twitter account previously posted images of a claimed logic board that suggested the possibility of fast-charge technology for the next iPhone.